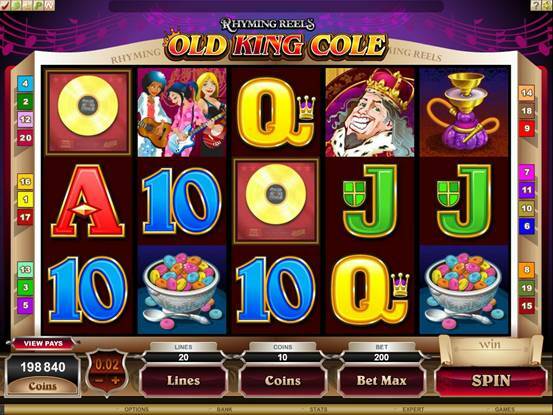 Enjoy a modern twist to a classic English nursery rhyme when you play the brand new Rhyming Reels Old King Cole Video Slot. His 3 fiddlers have been replaced by 3 young and trendy guitarists that could help you reap some merry rewards. But the symbol you really need to keep an eye out for on this 5 reel, 20 payline festive Slot is the Scatter Crown – 3, 4 or 5 will activate 12 Free Spins with an up to 7x Multiplier. Plus, to add to your royal feast of Wild and Scatter treats is a Gamble Feature that could double or even quadruple your winnings. 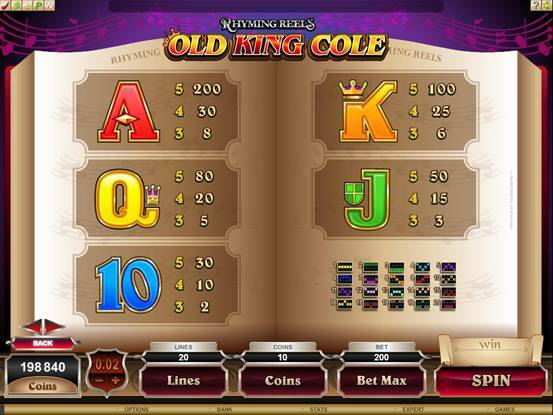 Jackpot City Casino has launched a new take on an old traditional song this week with an addition to its Rhyming Reels series of slots titled OLD KING COLE. 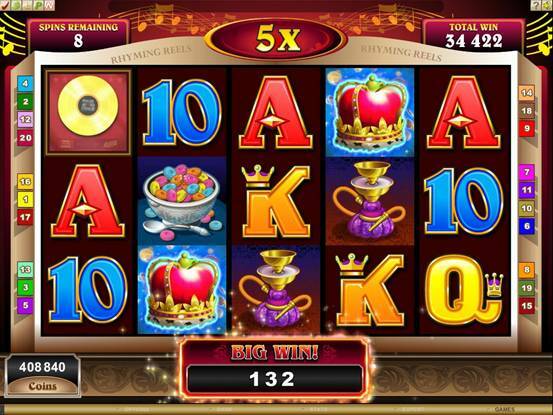 There's nothing ancient about the software powering this 5 reel, 20 payline video slot, however - it's both modern and chock-full of features like Free Spins, generous Multipliers, a double Wild and a Gamble offering where players can wager on card and colour to double or quadruple winnings. In the original rhyme, the rather cool-looking King Cole calls for his pipe in the middle of the night, and he calls for his fiddlers three...that has all changed in the innovative new theme applied to this game, where the musicians are three rocking girl guitarists, the pipe is replaced with a hookah, and the King's bowl is full of colourful fruit loops! 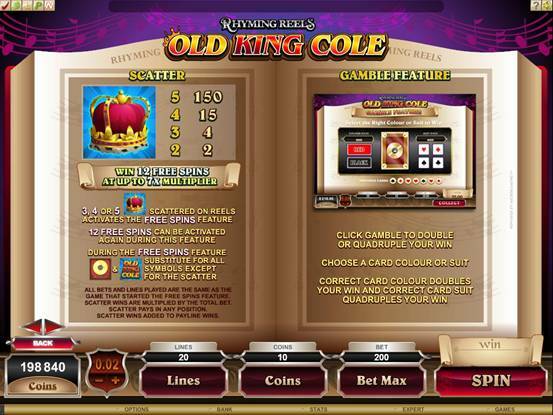 The game features an additional Wild during the Free Spins cycle, improving winning combination possibilities through the king's logo and an up-to-date gold Compact Disc, while on the Scatter front, the king's ornate crown across reels 3, 4 or 5 triggers 12 Free Spins with a multiplier of up to 7x. The Free Spins feature is made even more attractive by the possibility that it can retrigger during the free round, with similar multipliers. 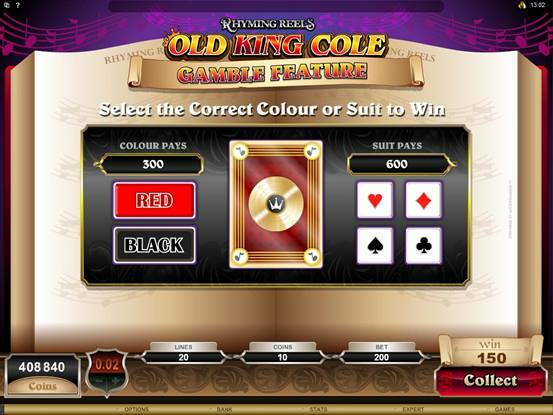 Rounding off an entertaining and potentially generous set of features is the popular Gamble offer in which players can elect to predict the next suit and colour to double or quadruple winnings. Players can achieve remarkable results with a maximum bet of 100.00 on this game; over 17 000.00 in the base game and over 120 000.00 in Free Spins.